In the past, if you wanted to dine at the Eiffel Tower, you had to go to Jules Verne, a ridiculously overpriced restaurant on the second platform run by Alain Ducasse. The view is breathtaking, but the price is just plain highway robbery! Well, now there is another option that still allows you to keep some Euros in your pocket! A new restaurant opened up on the first platform at the end of March. This used to be a private conference room area closed to the public. 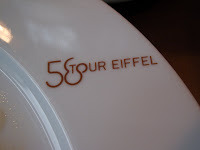 But it has been re-done into a brand new restaurant called 58 Eiffel Tower. It sits at 58 meters above the ground, hence the name! 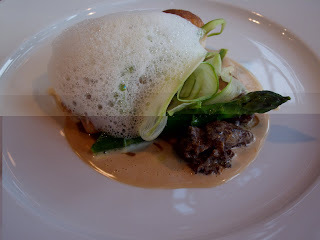 The restaurant is unique in that it serves products only produced in France (or French territories) so the ingredients are fresh and only what is in season. The preparation of the food is a challenge due to the harsh constraints of all the fire regulations for the tower. There is no gas, everything is electric which any chef will tell you is not the easiest when it comes to controlling temperature, etc. 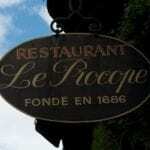 They offer a really lovely fixe prix menu for 80 Euros that includes a glass of champagne, a starter, wine and water, main course, dessert, and coffee. It really is quite reasonable considering where you are eating it! You can also order a la carte as well if that is what you prefer. In addition, they have a kids menu as well. You must make a reservation. 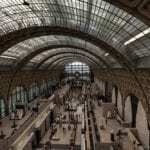 This reservation allows you to (a) go to a special booth where you do not have to wait in line to pick up your ticket, (b) access to a special no-wait line to access the elevator to the first platform (c) full access to the first platform. If you want to go to the second platform, you have to pay a supplement. 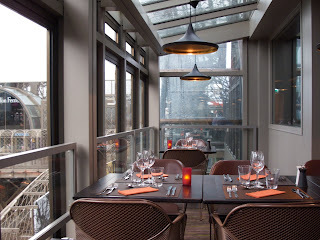 When making a reservation, try to get a table on the outside so you have a view on Paris, rather than on the inside, which gives you a view of the interior of the tower. My husband and I called last minute and could only get on the inside. Despite the fact that we did not have a view “out,” the view in is cool as well. The food was very good. 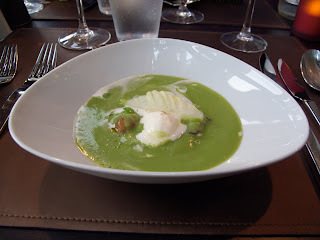 I had a lovely pea soup as an entree (my husband had salmon). 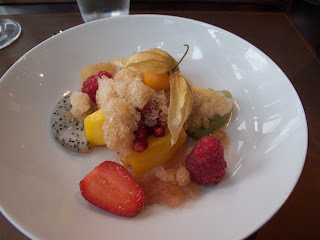 For dessert, I had a fruit granita (I forgot what hubby had! ), it was fresh and fabulous. Coffee was excellent and was served with little treats as well. We left, happy and full and with photos taken from all sides of the Tower. 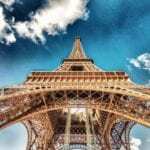 It had not been to the Eiffel Tower in 20 years and even longer for my husband, we tend to avoid that area, but I can tell you, dinner at 58 makes it well worth the trip and I highly recommend to do it at least once. So beautiful! Oh, and thank you for recommending a restaurant. Have you ever been to Richmond? Not the cleanest city, but definitely fun to explore. David and I go almost every weekend to hike the beautiful trails of Belle Isle on the James River, or just to explore the city. I have an entry soon with nothing but Richmond photos. They're gorgeous pictures. I'll definitely try that restaurant soon though, thanks! Thanks so much for the peek into your trip! I feel like I was in your pocket, even if just for a minute! That sounds lovely! I haven't been to Paris in 15 years but hoping to drag my hubby once the kids are old enough to pawn off on our parents for a week. looks delicious! and i am glad that they are doing this. our 7yo LOVES the eiffel tower – next time we're in paris, we'll head here. thanks for the recommendation! wow is that foamy stuff on your dessert, it looks deliciouis! Love food. The meal looks delicious. Wow. Paris, lunch in the Eiffel Tower.